Thick Greek yogurt acts as the base for these easy, homemade popsicles. Have fun with the swirling part—it’s the perfect thing for little hands to help with. Adding in some of the juice as you swirl gives you a burst of fresh juice in the finished popsicles. You can also simply just pour the yogurt mixture right into the molds and add juice as you go to swirl (and not divide it and add the juice and powder to the blender to make a separate blue batch). The result will be a more white popsicle with blue streaks, versus a more overall blue color. It just depends on how blue you want them. 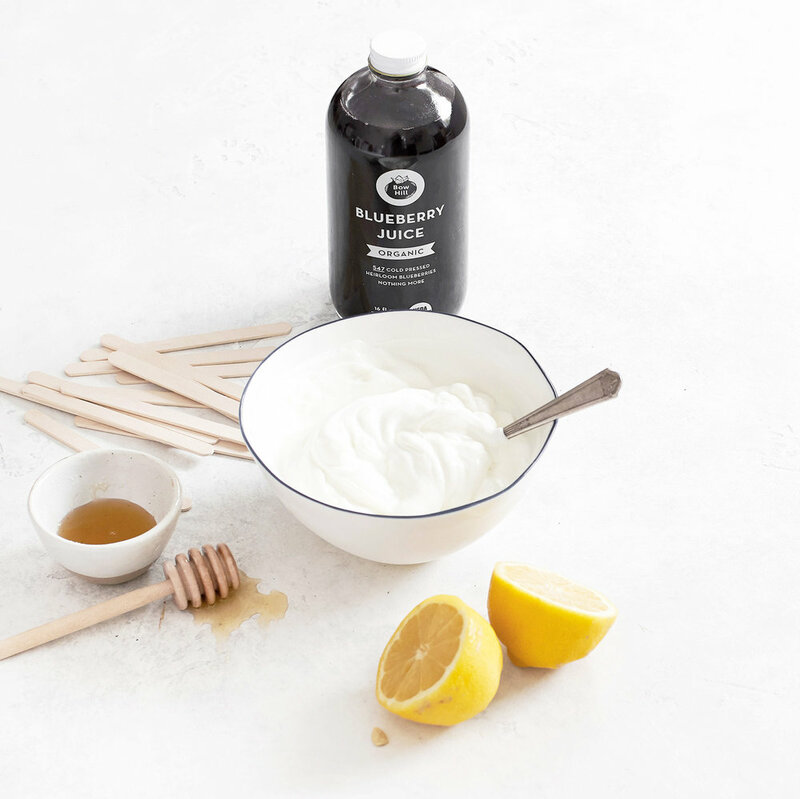 In a blender, combine yogurt, coconut milk, honey, and lemon juice. Blend until well combined and smooth. Taste for flavor and add in additional honey if desired. Pour half of mixture into a bowl. To remaining mixture in blender, add blueberry juice and blueberry powder and pulse to combine. Pour into a separate bowl. Fill a popsicle mold about 1/2 full with blueberry yogurt mixture. 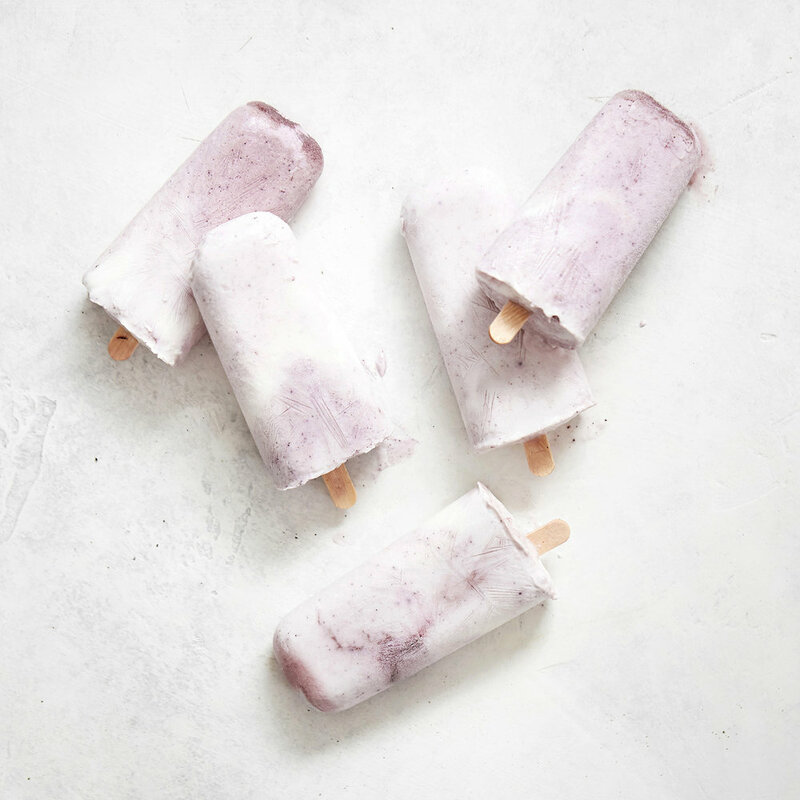 Add a dash of blueberry juice and using your popsicle stick, gently swirl juice into yogurt mixture. Fill popsicle mold with plain yogurt. Add another dash of blueberry juice top on top and gently swirl into popsicle. Repeat with remaining popsicle molds. Add a popsicle stick into center of each, cover, then place popsicle mold in freezer. Chill for at least 6-8 hours. cook’s note: You only want to use the thick milk part of the coconut milk reserving the water for another use. The leftover coconut water is a perfect addition to your morning smoothie. editor’s note: Want to give Bow Hill Blueberries products a try? Use code THECOASTALTABLE for 10% OFF your order.